Beautifull chariot of Pierre de Lasenic. I like the Plant, The vegatable world, that seems to be, not to be destroyed by the feets of the horses, the animal Kingdom. I Wonder why the black horse is on the right of the picture while the white Sphinx on the RWS is on the right Side. The symbol in the middle is a equal armed cross from a Zain, and I think a Sword, or Knife. I do not find V.T. on this picture. Is it somewhere hidden? lucifall: I Wonder why the black horse is on the right of the picture while the white Sphinx on the RWS is on the right Side. This isn't an esoteric deck lucifall. It's a historical one that existed long, long before RWS! There are no 19th or 20th century 'occult symbols' in these images. I assume you mean the Conver and not the Lasenic, Bee ? - cos the Lasenic was first published in 1938... and is as esoteric as they come ! Yes indeed Gregory That's what this thread is supposed to be about. Members who wish to discuss the later occult decks can do so in the other forums. Inasmuch as the intent behind the design of Tarot remains ‘hidden’, the emblems collected together within the Marseilles & Milan patterns could still be considered ‘occult’. The question is really whether Tarot was informed by an esoteric tradition in western civilization that influenced subsequent movements like the Golden Dawn. In the case of the escutcheon initials on The Chariot, the V.T. most probably originates from “Veuve Toulon”. However, it is feasible that someone could also have intended it as a hint to the route followed by The Chariot ‘up’ the Tree of Life. “I.N.” could be interpreted likewise. 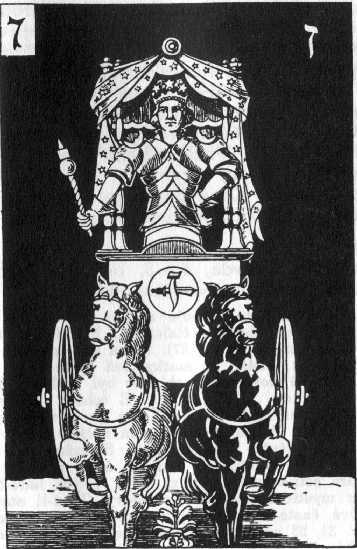 In brief, you could say Le Chariot serves as a vehicle for transporting a symbol from the ‘bottom’ of the Tree to a position along its’ middle pillar in order to ‘complete’ a matrix of hexagonal symmetry consistent with an orthographic projection of the Cube. The four pillared canopy is perhaps an allusion to this ‘hidden’ dimension to the Tarot. The printer's initials have a kind of humor to them as well -in that, adorning that particular icon, the deck itself becomes 'the vehicle' for whatever path you choose to take with it. I still don't get how the "veuve toulon" idea makes any sense. No one has responded to the question of why the widow toulon would have placed her initials on a deck of cards which she inherited from her husband. wouldn't it make more sense that the cards would have had HIS intials on them in the first place? where are they, and why would she have changed them? even if they were left blank by her husband, wouldn't you think she would place his initials on the card in his honor? and even if she DID go to the extent of putting her own initials on the card, why would she chose to use "veuve" instead of her first name, as everyone else in the card busisness did? This is a bit of a stretch, to say the least. I think my first post on this thread answers those questions quite well. Veuve Toulon remains the only plausible suggestion. Henry René D’Allemagne, vol. 2, knows Veuve Toulon, and gives her first name, Françoise; she was widow of Jean Toulon, and by D'Allemagne's list she is known from 1750 to 1755. The title “Veuve so-and-so” is of course used when the lady is of high social standing, and was often given to a business if she inherited it from her husband and made it prosper; the best known in English might be the popular champagne Veuve Clicquot Ponsardin (normally referred to as just “Veuve Clicquot”), named after Barbe-Nicole Clicquot (née Ponsardin), widow of François Clicquot who died in 1805. P. 316, Joseph Isnard buys the office of inspector and controller of cardmakers from the Veuve Toulon, in 1755. She was the widow of Jean Toulon, who died on January 15, 1755. P. 520 shows she was receiving a pension from the community of cardmakers in Marseille in 1753, and was already styled “veuve”. This apparent contradiction doesn’t concern us; what does concern us is that the hectic business of the cardmaking industry in Marseille could have allowed that Nicolas Conver ended up with plates that had been sold under the name of Veuve Toulon. He then put his own name on the 2 of Deniers. (Nicolas Conver is attested 1760-1803; his widow continued the business as Veuve Conver, attested in 1807). I respect D'Allemagne and I believe it could be the right interpretation finally. More information to be issued when my Nicolas Conver 1760 edition will be published (early July coming).